Scale Height is used to calculate the pressure acquired by a parcel of air moved up or down in the atmosphere at constant temperature. It holds well on Mars according to textbooks, such as the Martian Climate Revisited (Read and Lewis, 2004). I initially thought that the issue here was if one uses it with the minimum pressure on Mars as recorded with radio occultation (2.8 mb) by Mariner 9, the pressure values generated for areas like the Viking lander sites greatly exceed accepted values. However, apparently the 2.8 mb did not reflect any pressure measured on Olympus Mons, which is the highest mountain on Mars (and also in our solar system). Mariner 9 never saw the minimum pressure on Mars. This is discussed in my Report's discussion of radio occultation. In particular see the map below. It shows where radio occultation points on Mars were and were not taken. 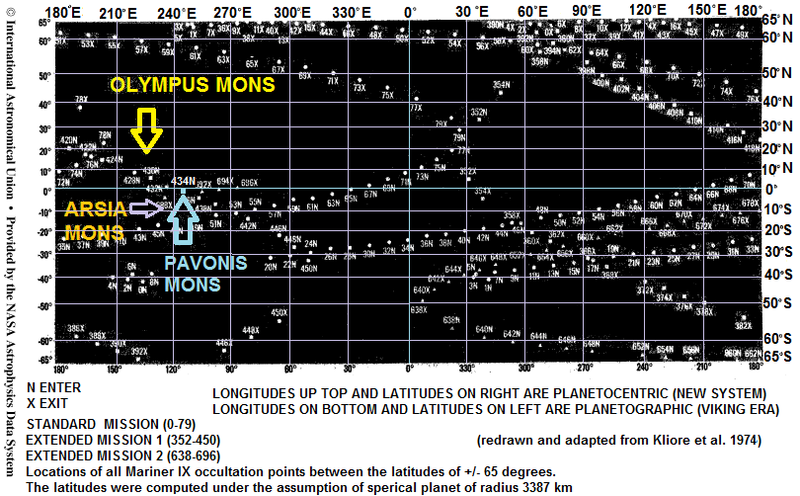 The calculations based on that assumption are shown below it and are offered just in case someone at NASA/JPL took actual occultation data points and then extrapolated and published pressures for the summit of Olympus Mons. Radio Occultation experiments on Mariner 9 missed Olympus Mons and Arsia Mons, but not Pavonis Mons (434N). Mountain locations are: Olympus Mons 17.3495N, 226.31E; Pavonis Mons 0.0626096S, 246.674E; Arsia Mons 9.12736S, 238.261E. *As all values are below what I treat as the zero elevation (this is the only way to give an increase in pressure not decrease).